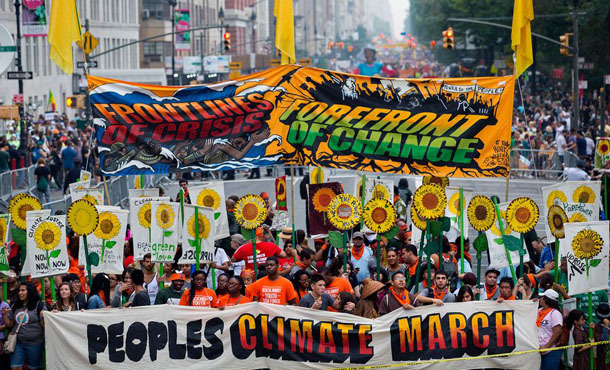 The People's Climate March Is Over -- Now What? Last Sunday, I was among the more than 300,000 people parading down New York's Sixth Avenue, calling for international action on climate change. The largest demonstration of its kind, the People's Climate March was just one of some 2,700 events around the globe that day, all delivering the same message to world leaders, many of whom are meeting this week at the United Nations. President Obama addressed the General Assembly on Tuesday afternoon, calling on all countries to join the United States "not next year, or the year after, but right now" to dramatically cut carbon emissions. He cited a number of his administration's accomplishments, which include the first carbon emissions rules for vehicles and pending controls on power plant carbon pollution. He also boasted that, since 2005, the United States has reduced its carbon emissions more than any other country. Fortunately, he immediately followed up that statement with: "But we have to do more." He got that right. In fact, we have to do a lot more. While it is true that the United States cut 649 million tons of carbon emissions from 2005 to 2013 -- more than the European Union's 614 million tons -- it amounted to only a 10 percent reduction. The EU, by comparison, reduced its emissions 13.9 percent over the same time period. Moreover, EU emissions are down about 18 percent from 1990 levels, while U.S. emissions are up about 10 percent, according to Global Carbon Project data. So now that Sunday's massive Manhattan event is over, what can we do while the Obama administration continues its struggle to compensate for a disengaged Congress? The average American is responsible for about 21 tons of carbon emissions annually, according to the Union of Concerned Scientists (UCS). If every American cut those emissions by 20 percent over the next year, it would be the equivalent of shutting down a third of the nation's 600 coal-fired power plants. That would be real progress, with or without congressional action. How do we get there? Two years ago, UCS published a book, Cooler Smarter, which provides a blueprint for meeting that 20 percent-reduction goal. Below are some of the book's top recommendations, which will not only shrink your carbon footprint, but also save you money in the long run. If you are in the market for a new car, trade in your gas-guzzler for a more fuel-efficient one. If you traded in an SUV for a hybrid, for example, you could cut your auto emissions in half. Just doubling your fuel economy by swapping a 20-miles-per-gallon car for one that gets 40 mpg would cut more than 3 tons of carbon pollution a year. At $4 a gallon, that would save you as much as $1,200 a year. Investing in a hybrid will more than pay for itself. A new hybrid car costs $3,000 to $5,000 more than a comparable gasoline-only model. If you drive an average of 12,000 miles a year, you would save that much on $4-a-gallon gas over the first four to nine years you own the car. It's also a good time to consider buying an electric car. Today, 60 percent of us live in regions where electric cars powered by the grid are now responsible for less carbon pollution per mile than even the best hybrids, according to UCS. Plug-in vehicles do come with a higher price tag, but tax credits and state rebates will help offset the upfront cost while annual fuel cost savings can amount to $750 to $1,200 a year. Want to cut your emissions even more? Power your electric car with rooftop solar panels. And if you want to cut your emissions even more than that? Go without a car. If you live in a city with a decent public transportation system, bike lanes, car-sharing services, or all of the above, why not? At least half of the nation's electric utilities now allow their customers to buy power from carbon-free, renewable energy sources for a few cents more per kilowatt hour. Homeowners also should consider generating their own power by installing solar panels on their roofs. Prices have dropped nearly 90 percent over the last two decades, and there are federal and state incentives and rebates that can reduce installation costs by 50 percent or more. Energy efficiency is the other side of the coin. If you own a house, getting an energy audit to find and seal leaks can help reduce typical heating and cooling loss by 15 to 25 percent, the equivalent of leaving a window wide open all year round. Besides that, older appliances generally consume a lot of energy, so consider replacing your ancient furnace, air conditioner and refrigerator. Lighting can eat a lot of energy, too. Switching to energy-efficient bulbs can cut annual lighting bills by at least 75 percent, which would amount to a $140 annual savings for a typical household. Finally, many electronics, including computers and home entertainment systems, consume standby power when they're not in use. You could easily save $100 or more a year -- and cut carbon pollution -- by plugging them into a "smart" power strip surge protector and turning them off completely. Eating less meat -- especially beef -- is the most effective way to lower the carbon emissions associated with your diet. Not to worry: You don't have to become a vegetarian or a vegan. By just eating smaller meat portions, or skipping it occasionally, you would make a big difference. A diet comprised mainly of whole grains, vegetables and fruits would lead to dramatically lower emissions than a meat-based one, and it's healthier, too. Just to give you an idea of the difference, UCS found that a pound of beef is responsible for about 18 times more carbon emissions than a pound of pasta. The average American eats about 270 pounds of meat a year, which is nearly four times the global average. If an average American family of four cut their meat intake in half, they would reduce their carbon emissions by about 3 tons a year. These individual initiatives, while critically important, can take us only so far. We sorely need concrete action at all levels of government -- and in the private sector -- to tackle what is arguably the biggest threat to the future of civilization. How can we prod our elected officials to take climate change seriously? By making climate a priority when we step into the voting booth. Indeed, voting is perhaps the most important thing you can do to protect the climate. I work for a nonpartisan organization, so I can't tell you who to support. But I can tell you the obvious: Vote only for candidates who accept the conclusions of mainstream climate science and pledge to do something about it. Historically, the environment has never been among the top 10 concerns of American voters. This year, the economy, job creation, health care, government spending and education are foremost on voters' minds. But climate change is much more than an environmental issue. If the United States and the rest of the industrialized world don't slash carbon emissions soon, the consequences for the economy, public health, our food system, you name it, will be dire. The time is now.